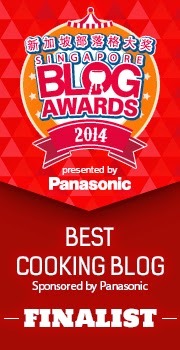 Because of your support, this blog has been selected to be one of the finalists For the Best Cooking Blog in this year's Singapore Blog Awards! Thank you so much for your support for the last year, and I have to be thick-skinned and ask you to cast me a vote by clicking on the badge below. S'mores is an American and Canadian tradition. It is basically a roasted marshmallow and a layer of chocolate sandwiched between two layers of graham crackers. They are usually eaten at campfires. Thankfully, we don't need to build a campfire to enjoy this treat in tropical Singapore. All we need to do is to take Chocolate + Marshmallow + Graham crackers, put them together, and make this! This is such a treat, and it is not at all difficult to make! This brownie is super moist, and full of chocolaty goodness and not overly sweet. In a small saucepan, I stirred together butter and chocolate over low heat until well-combined. This was set aside to cool. 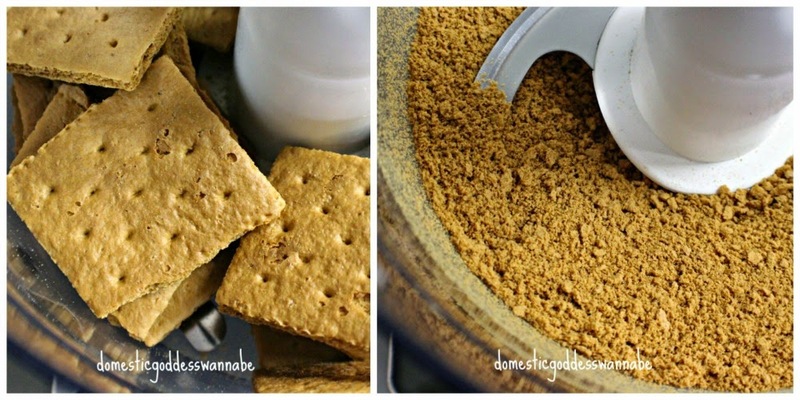 In the bowl of my food processor, I blitzed the Graham crackers. You can also place the crackers in a ziplock bag and bash them gently with a rolling pin. This, too, was also set aside. In my mixing bowl, I whisked the eggs, sour cream and vanilla beans. The flour was added, and I continued mixing. Then I added the chocolate. Finally, I added the Graham crackers, chocolate chips and marshmallow. And mixed until just combined. This was transferred into a lined and greased baking tray and baked. When the brownie had cooled, I removed it from the tray and cut it into 16 squares. These brownies are really more-ish, but they are also very potent. So remember to try to resist eating too many at once! 1. Pre-heat oven to 350°F (176.6°C). Line an 8-inch square baking dish with parchment paper and grease it. 2. In a small saucepan, stir butter and chocolate over low heat until melted and well-combined. Set aside to cool slightly. 3. 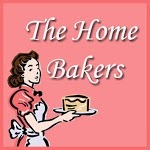 In a medium bowl, whisk together the sugar, flour, baking powder and salt. 4. In a large bowl, whisk together the eggs, sour cream and vanilla. Add the flour mixture and whisk well. Add the melted chocolate and stir until blended. Add the Graham crackers, marshmallows and chocolate chips and stir gently until well-blended. 5. Scrape the batter into the baking pan and spread it as evenly as you can. Bake for 24-26 minutes, until puffed and the centre still jiggles when the pan is gently shaken. 6. Cut into 12 or 16 pieces. Note: The brownies can be stored in the fridge in an air-tight container for up to a week. 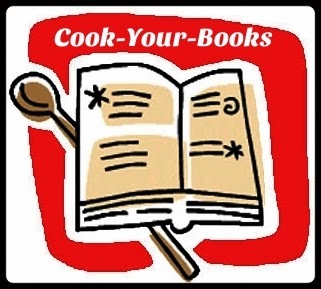 I am submitting this post for Cook Your Books hosted by Joyce from Kitchen Flavours. Diana, you are killing me again! Arrghhh....must but marshmallows and bake this! I see that you have murdered Phong Hong with these irresistible brownies... now, me! LOL! Diana, I know these brownies are irresistible ... but but but ... my 'waistline is beyond expansion' ... so I'll just admire these lovely pics ! Karen, LOL! Yes i totally understand. My waistline is the same, if not worse!! !